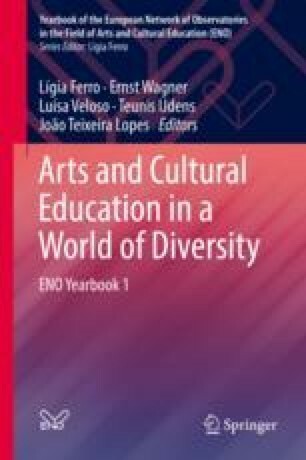 In this chapter we discuss the conceptualisation of cultural diversity in arts education research in three Finnish universities Aalto University, University of Lapland and University of the Arts, Helsinki. We articulate how the changing societal and environmental conditions need to be taken into account in both the research and practice of arts education in Finland. We present three different approaches to arts education research aiming to reflect the different frameworks and contexts of researching in each institution. In the Department of Art at Aalto, selected ongoing work of professors, researching lecturers, postdoctoral researchers and doctoral students of arts education is analysed, categorised and reflected. The perspective of the Faculty of Art and Design at UoL focuses on selected research group work (NACER) and on three multidisciplinary research projects, which introduces the research method developed in the North: arts-based action research (ABAR). The Uniarts section introduces the work of the Centre for Educational Research and Academic Development (CERADA), and more specifically the research initiative ArtsEqual, in the context of research-based arts pedagogy. Borgdorff, Henk. 2010. Artistic research as boundary work. Proceedings of CARPA 1 – 1st Colloquium on artistic research in performing arts, theatre academy, Helsinki November 19th–21st 2009. Available at: http://www.uniarts.fi/sites/default/files/CARPA_1_proceedings%20%282%29.pdf. Accessed 14 Dec 2017. Creative Connections. 2017. Web pages. Available at: http://creativeconnexions.eu/. Accessed 28 Nov 2017. Häyrinen-Alestalo, Marja. 2003. Yliopisto- ja tiedepolitiikan nousu ja uho. Tieteessä Tapahtuu 21(2). Available at: https://journal.fi/tt/article/view/57203. Accessed 28 Nov 2017. Hiltunen, Mirja, Enni Mikkonen, Anne Niskala, Moira Douranou, and Emma Patrignani. 2018. “My stage – sharing and creating a story of our past, present, and future in Finnish Lapland” in Synnyt/Origins 1/2018: Finnish studies in art education. Available at: https://wiki.aalto.fi/pages/viewpage.action?pageId=139659880&preview=/139659880/139659875/HiltunenEtAl_synnyt_june2018.pdf. Accessed 18 Aug 2018. ———. 2010. Taideperustainen tutkimusparadigma taidekasvatuksen sosiokulttuurisia ulottuvuuksia rakentamassa. Synnyt/Origins: PARADIgMA. 4/2010, 15–25. Available at: https://wiki.aalto.fi/display/Synnyt/Home. Accessed 28 Nov 2017. Kamensky, Hanna. 2016. It’s all in the genes? Equally Well blog. 11.10.2016. Available at: http://www.uniarts.fi/blogit/equally-well/its-all-genes. Accessed 14 Dec 2017. Nacer. 2017. Web pages. Available at: https://nacerteam.weebly.com/. Accessed 28 Nov 2017. Nordic Council of Ministers. 2011. Megatrends. TemaNord 2011: 527. Copenhagen. Available at: http://www.norden.org/en/publications/publications/2011-527. Accessed 28 Nov 2017.